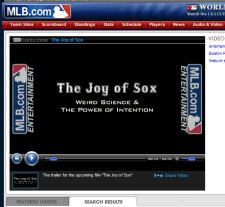 THE JOY OF SOX MOVIE TRAILER ONLINE AT MLB.COM! You can now watch our new trailer for The Joy of Sox Movie! A recent article about The Joy of Sox Movie by MLB.com (The official web site of Major League Baseball) included our new trailer in the article as well as a larger display version. Click Here to view the large version of the trailer! THE JOY OF SOX MOVIE REVIEWED ON MLB.COM! Doug Miller of MLB.com recently reported on The Joy of Sox Movie. From his August interview with Producers Joel Leskowitz, Karen Webb, and Rick Leskowitz he reports on those intangible moments that The Joy Of Sox Movie is all about, some background on the producers (us!) and the science behind the Joy. Click here to read Doug's great article! We've recently updated the look of our blog. Make sure to check it out to see what's going on with the movie, spirituality, Energy Medicine and all things related to the power of intention!